We have represented Omni Structures International since 1994. 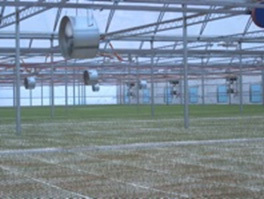 They off a wide range of high quality commercial reinforced gutter connected and freestanding greenhouse structures and cold frame / tunnels. 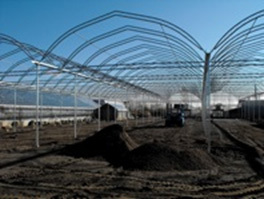 The gutter connected and freestanding structures excel in offering very high strength for high snow, crop and wind loads and feature full welded web double cord truss style arches and trusses. This is a valuable asset for the modern grower since it allows complete adaptability to present and future plant management or methods or facility use. Not many other structure types or models or manufacturers provides this type of flexibility in use. Easy to assemble. All components galvanized, galvalum treated, aluminum or zinc plated for corrosion resistance. 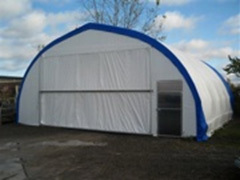 All structures with exception of the cold frames and tunnels can be clad in single or double film greenhouse poly, reinforced poly and 8 mm double or triplewall polycarbonate. 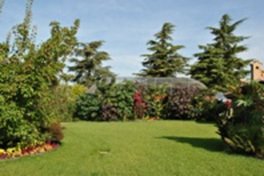 Since 1994 we have supplied over 500,000 sq. ft of these structures into Sask, Alberta and BC not including projects into US or overseas. We are pleased that almost 65% of the square footage has been constructed by company for our clients. This experience has provided us with a wealth of product knowledge, installation application and facility operations. The work horse for large commercial and wholesale growers and allow for future endless continual expansions of your greenhouse area. The new houses simply adds area onto the existing greenhouse width by adding new additions onto the sides of existing structures. 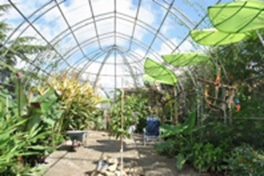 Our gutter connected greenhouse structures are available in widths of 24 ft ( 7.3M ), 27 ft ( 8.2M ) and 30 ft ( 9.14M ) and are available in modular lengths of 12 ft ( 3.6M ). These houses can be clad in single reinforced poly, double inflated poly and hard clad 8 mm twin or triple wall polycarbonate sheeting. Choices of height under the gutters provided include 11 ft ( 3.3 meters ), 12 ft ( 3.6M ), 14 ft ( 4.2M ) and 16 ft ( 4.8M ). 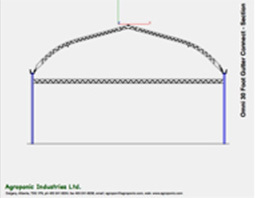 Standard features include reinforced double cord gothic profile arches at 6 feet ( 1.8M ) on center, reinforced energy trusses placed at 12 ft ( 3.6M ) on center at all column locations, heavy V-bottomed gutters, “no condensate drip” intermediate roof purlins that clamp onto the bottom cord of the arch which effectively tie all arch sets together, corner wind bracing and column x-bracing all of which forms the industries strongest structures available. Side walls can be furnished with a wide range of cladding and door types and through the wall equipment framing is needed. 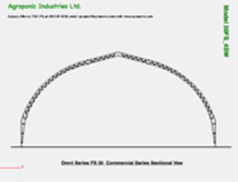 Ends can be furnished with a wide range of cladding types, door types and through the wall equipment framing. Ventilation options include roll-up side walls ( poly cladding only ), rack and pinion sidewall vents ( hard sidewall cladding only ), roll-up roof and gutter vent systems ( poly cladding on roof only ), single and double ridge vents ( hard clad roof only ). Fan and shutter cooling systems are available on request and sized to meet the demands of the project. For further details Omni Gutter Connects. 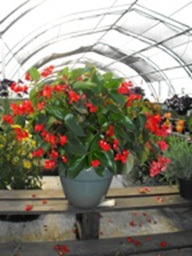 Very popular for all facets of the commercial greenhouse industry. 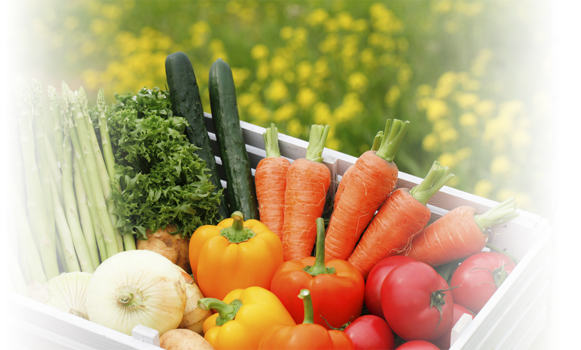 They are ideal for the new grower and existing growers alike. 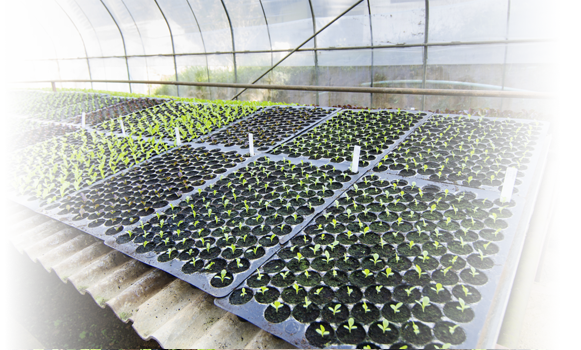 For the new grower they provide reduced beginning capital expenditures, ease of installation and establishment. For the existing grower they allow crop groupings for different environmental growing conditions and cycles, limited extended season operational and management advantages. 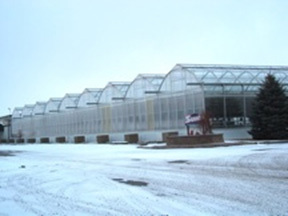 Our commercial series freestanding structures reinforced gothic style houses which provide much greater snow/wind and crop load capacity than most other greenhouse types. Our houses can be clad in single poly, single reinforced poly, and hard cladding such as 8 mm twin or triple wall polycarbonate ( triple wall is standard.) These houses are available in widths of 24 ft ( 7.3M ), 27 ft ( 8.2M ), 30 ft ( 9.1 M ), 36 ft ( 10.9 M ) and 40 ft ( 12.1 M ) and available in any 12 ft ( 3.6 M ) modular lengths. 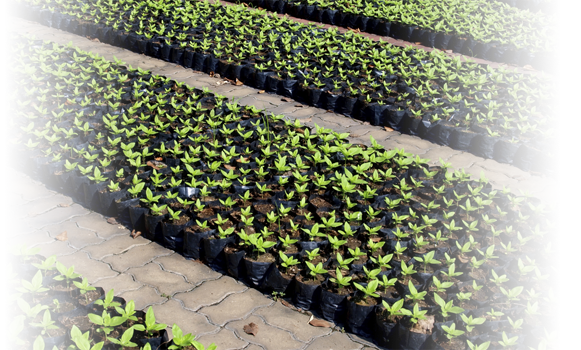 A new year of tree seedlings !